Muttenz, May 7, 2013 – Clariant, a world leader in specialty chemicals, has launched ColorForward™ Interiors, the first color and trend forecasting tool of its kind. It provides designers and producers of textile yarn and filaments with insight into what consumers will respond to in 2014 and beyond. ColorForward Interiors expands on the foundation of Clariant’s well-accepted ColorForward color direction guide. Now in its eighth year, ColorForward’s directions have helped define the colors that can be expected to attract and move consumers in the future. It is the result of the collaborative effort of plastics color specialists from North and South America, Europe and Asia in the global network of ColorWorks™ design & technology centers of the Clariant Masterbatches Business Unit. The service has helped manufacturers of all types of products get a head start on understand how color can influence consumer purchasing decisions. 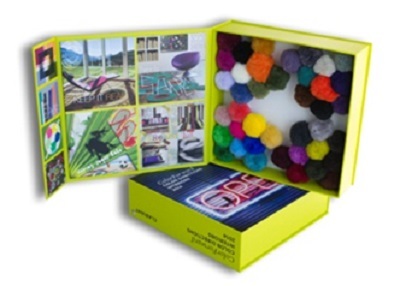 Now, the Clariant Masterbatches Textile Group has focused its specialized expertise to expand the ColorForward 2014 palette to help customers in the fiber and yarn market in the same way. ColorForward Interiors starts from a color palette created from an analysis of four important societal trends chosen by Clariant’s color experts from a myriad of global inspirations. Each trend theme is then represented by five colors that capture the spirit and emotion behind the trend. The palette is then doubled in size, to include complementary shades. Uncovering the most significant trends and the colors they engender is not a simple task. Experts in color, design, marketing and polymers from every part of the world, representing multiple disciplines, collaborated not only in identifying global societal trends, but also developing harmonious colors that reflect each trend’s special influence. At a time when consumers are overwhelmed with brands and bored with me-too products, manufacturers want to know how they can keep them excited. People want to feel a connection with the things. They want what’s real and tangible, and manufacturers need to understand this. To stand out in the marketplace, designs have to connect with consumers on a more personal level. After the recent recession, the public is tired and disappointed with old ideas and waste. They want to repurpose the old into new. This theme acknowledges a new freedom of expression that looks at existing materials from different angles and imagines new creations. In the mobile internet age where information on almost anything is easily accessible, shared thinking, collaborative reflection and networked learning are new approaches to inquiry-based research. Today’s young generation is more open to sharing knowledge and uniting ideas to solve world problems is ‘in.’ Money and possessions are perceived as less important, while the sharing of knowledge is seen as generous, and a better representation of goodness and value. 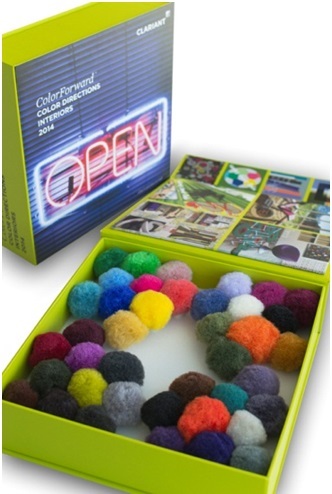 “The colors of There to Share are connective, suggesting how individuals around the world are connected, sharing their experiences, thoughts and ideas across time zones, as technology allows them to share, effortlessly and quickly,” reveals Judith van Vliet. The spirit of Brazil is what defines this theme. The 2014 soccer championship in Brazil will draw together millions of fans from diverse countries to share a common passion – their love for football, which really can reach the level of a religious fervor. Brazilians also express themselves through their colorful Carnival, infused with samba music and dance. These events draw immense crowds and can be perceived as an invitation to come together and unite to solve global problems. The world is opening up rapidly, and as it does, and new middle classes emerge, so too do new markets. Brazil is investing huge resources to change itself. The phenomenon of inclusion can be seen everywhere in the country. In addition, sustainable development events are powered by innovation. There is so much joy in the air, as Brazil has so much to celebrate.